As a two-time Olympian and three-time Olympic gold medalist, Douglas was the first African-American to win the Olympic all-around title. 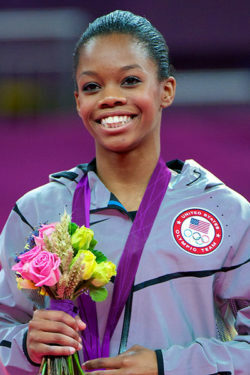 After helping the United States to team gold at the 2011 World Championships, she went on to earn the all-around gold medal at the 2012 Olympics, where she and her teammates won the team gold medal. In 2012, she was awarded the Associated Press Female Athlete of the Year and Women’s Sports Foundation’s Sportswoman of the Year. After a two-year hiatus from the sport, Douglas returned to capture the silver all-around medal at the 2015 World Championships and assisted her team in obtaining the team gold medal. Her accomplishments at the 2015 World Championship made history, as she became the first female reigning Olympic all-around champion to return to the World Championships and win an all-around medal since 1981. The following year she won the 2016 AT&T American Cup and captured the City of Jesolo Trophy all-around and team titles. During the 2016 U.S. Olympic Team Trials, Douglas became the first U.S. Olympic women’s all-around champion to make a second Olympic Team and the first reigning champion to return to the Games since Nadia Comaneci. As a member of the Final Five, Douglas helped the women win USA’s second-straight Olympic team gold medal. Douglas trained at Buckeye Gymnastics in Columbus, Ohio, leading up to the 2016 Olympics. In 2012, she trained at Chow’s Gymnastics and Dance in West Des Moines, Iowa. Currently, Douglas resides in Los Angeles.